I’ve been working in the promotional products industry for almost a decade now. It’s such a fun industry to be in; so many great people, so many great ideas and so many fun products to choose from! Our featured collection this month is called MopToppers™ and it’s one of my absolute favorites! These products are among my favorite for many reasons. First, they make people smile and people are instantly intrigued when they see them. Second, they look (sorry for using this word) A-DORABLE!. And third, they have universal appeal. Everyone from doctors to lawyers to schools to Tradeshow-attendees of all types just love them! When designing each MopToppers product, the creators put such an emphasis on their attention to detail. 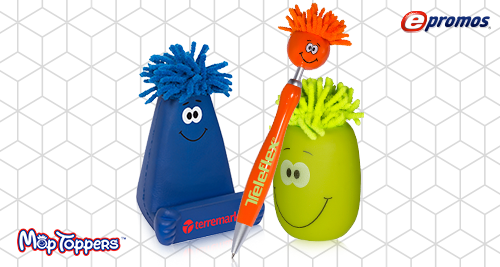 Their famous pen not only has a human body shape and a smiley face, but it also has a necktie-shaped clip. The doctor version has a stethoscope, and the Breast Cancer Awareness version has a light-pink ribbon. They even have a super-hero version! So much of successful marketing is choosing a product that ties in properly to your brand and your purpose – and of course is memorable. Consider lightening the mood with these cuties before an intense, stuffy and uncomfortable meeting. Or give them to employees with a message that says something along the lines of “When work feels overwhelming, take a minute to smile”. MopToppers are appropriate at any type of event, really — school functions, trade shows, nonprofit events, bookstores, workplace orientations and community show cases to name a few. For me though, the main benefit of these face-shaped products is the microfiber screen cleaner, or “hair”. You NEED to try the hair! Microfibers increase cleaning ability because the net-like structure traps considerably more dirt than other materials and keeps them in the mop top. In addition, the unique surface gets down into the nooks and crannies of your devices efficiently pulling out debris. Microfiber cleaning cloths are hypoallergenic, so they are nice for anyone suffering from allergies. Microfiber cloths are eco-friendly because they don’t require any soap or chemicals to do a great job. Microfibers are reusable and can be used again and again by simply rinsing with warm water to keep them fresh. Microfibers last longer than other cleaning materials because they contain more than 200,000 fibers per square inch of product. That’s tough stuff! Microfibers pick up dust, dirt, pet hair, microparticles and 98 percent of anything else your screens and monitors encounter. Rub a little harder and a MopToppers will remove sticky stuff, accidental spills, scuffs and more. What’s the secret? Microfiber is made up of nylon and polyester fibers that are considerably smaller than most other fabrics used for creating mops. Each strand is minute, and when they are woven together, they create a fabric packed with tiny pockets that trap dirt and water. When looked at closely, this dense material resembles a net, and the net-like structure is the key to its efficiency. Did you know that a whopping 89 percent of consumers remember the company who gave them the promotional product? With this in mind, it is easy to see why it’s so important to make great choices when deciding which promo product will represent your company best. Check out our MopTopper Collection and see for your yourself how much fun you’ll have with these! Your MopToppers product is small, but it will do some big cleanup. So, go ahead and clean your “hair” if it gets soiled. Simply rinse in warm (not hot water because the nylon component in microfiber will break down the fibers and ruin their effectiveness). If it’s really dirty, most cleaning detergents can be used, but adding bleach and fabric softener is not recommended. Air dry. Call us today, your Promo Know-How People and let us work together to find the right products for you.